We are excited to announce our CMEP1835 Summit! 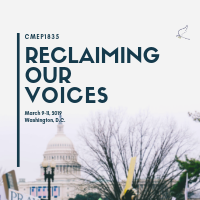 “Reclaiming Our Voices: Reframing the Narrative for a Shared Justice in Israel and Palestine,” will take place on Capitol Hill in Washington, DC, March 9-11. CMEP1835 is an extension of Churches for Middle East Peace. It seeks to engage young people, ages 18-35, in education and advocacy around Israel/Palestine, as well as the broader Middle East.